I was trying to drap files from my Eternal USB drive to the playlist area. Moving a file from my desktop to Mixxx is o.k. Dragging from usb drive to track view will work. Just restarted Mixxx after the crash. 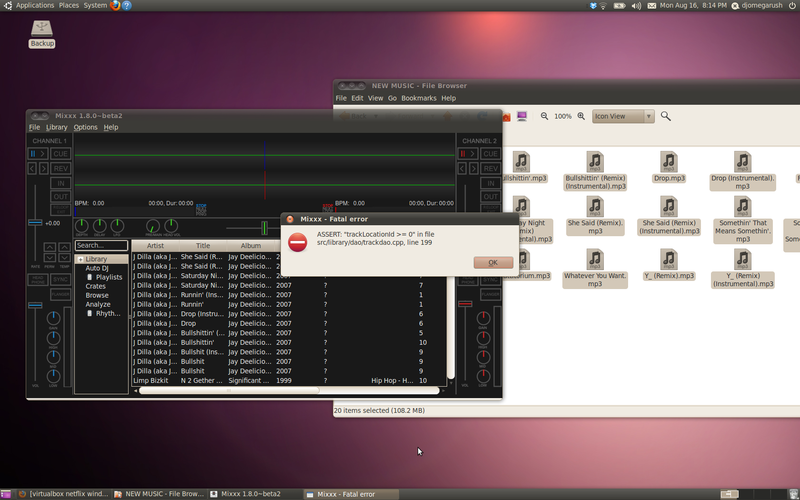 The files from the external drive are now listed in Mixxx, but it had to crash first for the files to show up. Removed the tracks. Tried again. Same thing. Drag, crash, restart, files listed. table failed for some reason and didn't already exist in that table -- i.e. 'shouldnt happen'. Albert, any ideas? Ok, switching back to QUrl::toLocalFile() instead of QUrl::toString(). Thanks a ton djomegarush, I'm glad this bug didn't slip into 1.8.0.